Omaha, Nebraska will soon open a Terror-Free Gas station. 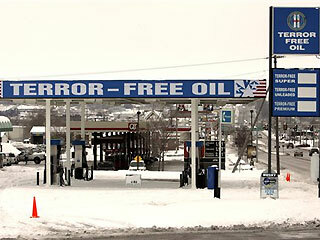 That's right; this oil is free of all terror and guilt. The company behind the gas station, that opens Feb. 1st, claims that their oil comes from companies that don't do business in the Middle East. Since we all know that terrorism originated in the Fertile Crescent this concept makes sense. Oil from all other regions of the world can’t have ties to terrorism. That would be illogical. Another theory is that this is a misguided marketing scheme to have a monopoly on all the “good” oil in Omaha. This reminds me of that SUV ad that made the connection between gas guzzlers and terror. I applaud the attempt to be unique and to take up a cause, but if you’re going to have a terror-free gas station, why not an ethanol station that doesn’t do business with the Middle East. Maybe a wind powered station that only works with wind that originated in the west. If you must take a stand, why not start an illegal-immigrant-free orange stand. If a butterfly flapped it's wings and caused a tree to fall that wasn't heard, is that terrorism? Maybe I went too far on that last one. I don’t support terror; I would even fill up at the Terror-Free pump. As long as the gas is cheaper than Sheetz and has MTO sandwiches, I’m sold. All this talk of gas reminds me of an ad I submitted to the One Show Competition last year. It was for Hybridcenter.org. It didn’t even place. The point is that gas dependence is the problem, not where you buy it from. It's going to take more than marketing to fix that.